Pepin Moore is proud to present an exhibition of new works by Paul Stoelting, on view from September 15th through October 20th 2012. A reception for the artist will be held Saturday, September 15th from seven to nine in the evening. All of the works included in Stoelting’s second solo exhibition with the gallery are scaled for the possibility of human interaction. Whether by material or referent the objects imply a direct relationship to the human body and question the separation between tactile and visual experiences. Yoga mats with generically ergonomic shapes cut from them hang tightly together on the wall and resemble a reserve of equipment as much as body-sized monochrome paintings; the cut shapes accentuating their industrial texture. Freestanding frame-like sculptures the size of doorways or interior passages are placed in the middle of each gallery and display rock-climbing holds at levels that might accommodate lifting or moving. With these and the other works included in the exhibition, Stoelting continues to explore concepts that divide utilitarian architectural space and the tactility of art objects while questioning the conventions of specificity and scale between the two. Paul Stoelting (b. 1981, Kiel, Wisconsin) lives and works in Los Angeles. He holds a Bachelor of Fine Arts from the Milwaukee Institute of Art and Design and a Master of Architecture from Southern California Institute of Architecture, Los Angeles. 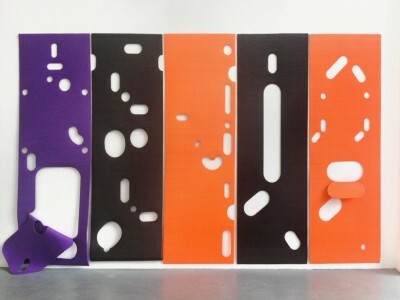 Stoelting’s work has been exhibited at Green Gallery, Milwaukee; Golden Age, Chicago; Swiss Institute, New York; and Karma International, Zurich; among others.